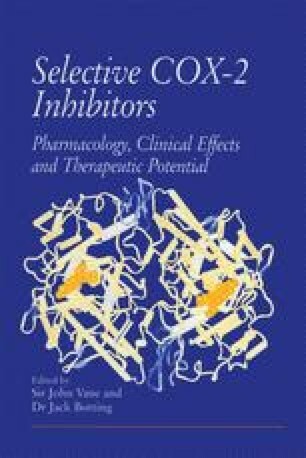 Since the discovery of a second isoenzyme of cyclooxygenase (COX), COX-21,2, it has been hypothesized that the anti-inflammatory effects of non-steroid anti-inflammatory drugs (NSAIDs) are achieved through a mechanism different from that underlying the often seen side-effects of these compounds, including disruption of cytoprotection of the stomach, toxic effects on the kidney and inhibition of platelet aggregation3. COX-1 is the constitutive isozyme found under physiological conditions in most tissues, a so-called ‘housekeeping’ enzyme, while COX-2 expression is induced, particularly during inflammatory processes4. It has been proposed that COX-2 inhibition is the relevant target for the anti-inflammatory effects of NSAIDs, whereas inhibition of COX-1 is responsible for their gastric and renal side-effects3,4. Most available NSAIDs block both COX-1 and COX-2 to a similar degree; however, newer compounds with selective inhibition of COX-2 should retain the anti-inflammatory activity of NSAIDs but have minimal gastro-intestinal side-effects.